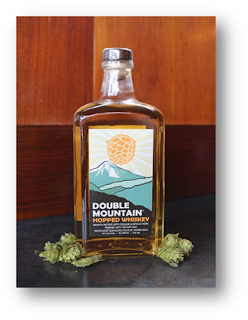 Hood River - Double Mountain Hopped Whiskey: Co-developed by Double Mountain Brewery and Hood River Distillers, Batch #001 of Double Mountain Hopped Whiskey pays homage to the bright flavors of fresh hops. Smooth citrus and floral flavors complement the sweetness found in 100% corn whiskey. It is currently available at the Hood River Distillers Tasting Room and will be on shelves soon at liquor stores throughout the Northwest.